Doing what I love while I can, and helping others to do the same. Focusing only on my own training can be a very selfish pursuit. Check out the ways in which I am happy to connect with others and spread the love of running! Fees listed are negotiable! Esther Atkins (formerly Erb) took a different path than most to her eventual marathon success. Growing up in Richmond, VA, Esther attended Maggie Walker High School before Case Western Reserve University, where she earned a degree in Music and Cognitive Science. Having not intended on running in college, Esther was recruited off a treadmill during freshman orientation. 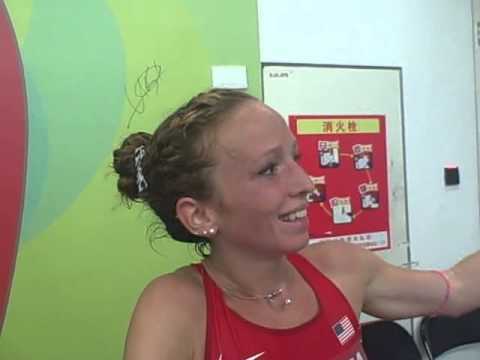 From that day, she went from a first-time cross country runner and a freshman 5k PR of 21:49 to one of the most decorated runners in Case Western Reserve history, earning six All-American titles and the 2008 DIII National Championship in the 10k. Esther continued her success after college, running to the 2014 USA Marathon Championship and a spot of the 2015 World Championships Marathon Team. In 2016, Esther placed 11th at the 2016 US Olympic Marathon Trials and the New York City Marathon. Esther's approach is a little less conventional than many of her elite counterparts, stating, "I am not a purist and have always listened to music and podcasts during my runs since the day I started. I don't think I could survive as a runner without podcasts like This American Life, TED Radio Hour, RadioLab, and Freakonomics." On her approach toward race day, she says, "Maybe it's because I'm so bossy, but one thing that I have discovered about myself is that I thrive off of the sensation of team work. I suffered from fairly severe performance anxiety early in my career, and it wasn't until I started making 'teammates' out of my closest competitors that I was able to overcome my anxiety. All of my best races have been due to a sense of togetherness with the people that I am running 'against'. It's because of the strength of this phenomenon that I finish with my hands in a heart over my head - a sign of love for my fellow runners and our common sport." When not logging the miles herself, Esther is a private online coach and works at Fleet Feet Greenville.